These cups belonged to my great aunt. I, who never played tea party or dolls, somehow ended up with a cabinet full of her travel-treasures, many of them dishes and gravy boats and little painted tea pots. She died when I was six or seven, I think, so I don't have the stories to go with them. She had an automatic crank-up card shuffler, too, and cheated like crazy. I loved her apartment in Denver, crowded with her collections, incense, furnished with expensive old stand-alone cabinets and divans with curved pecan wood feet. She was funny, adventurous, wry, elegant and nice to me. Really elegant, and really nice. This morning I wrote her into the third Resurrection of Magic book. It's a bit part, but I know she will like it. I would love to know if you can!!! Please be in touch. 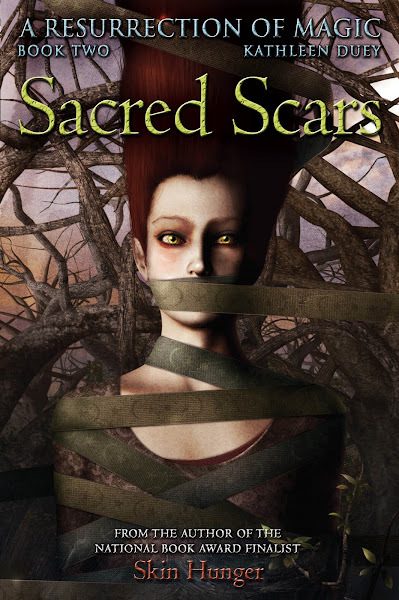 I have just re-read Skin Hunger and Sacred Scars, and as a result, am checking this blog almost daily to see if there are any updates about the third book - so I wish you luck finishing it and ask that you keep us updated! Thanks! for liking the books. I am writing the third one now, fast as I can. The details are...boggling...at times. I just went back about ten chapters to make sure the construction of Malek Park (see Skin Hunger, the third page of chapter four...) works as the timelines get closer and closer--they are 3-4 years apart now. Also had to make sure the copper roof of the Eridian meeting house 60 of our miles out in the countryside finished in time for Hahp to see it out of the carriage. I WILL post progress here and on FB and again, thanks!